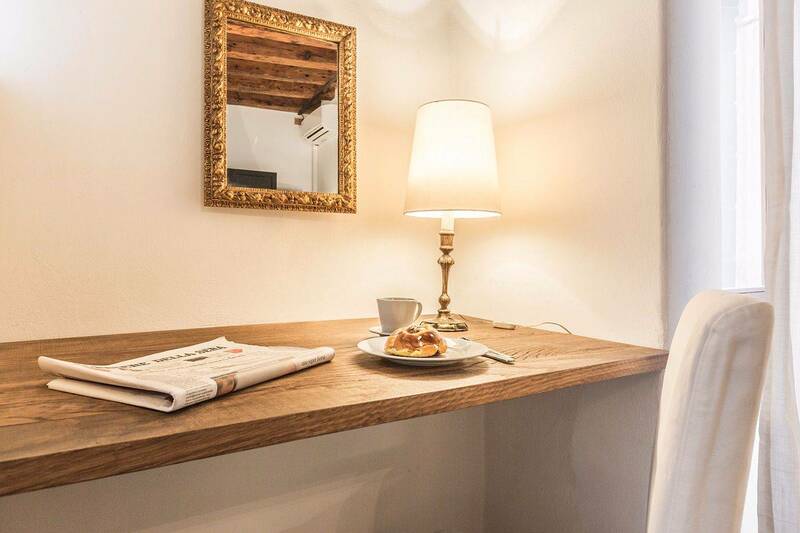 Sober and luminous, the Alba D'Oro apartment is located in the Rialto area, close to the famous market. 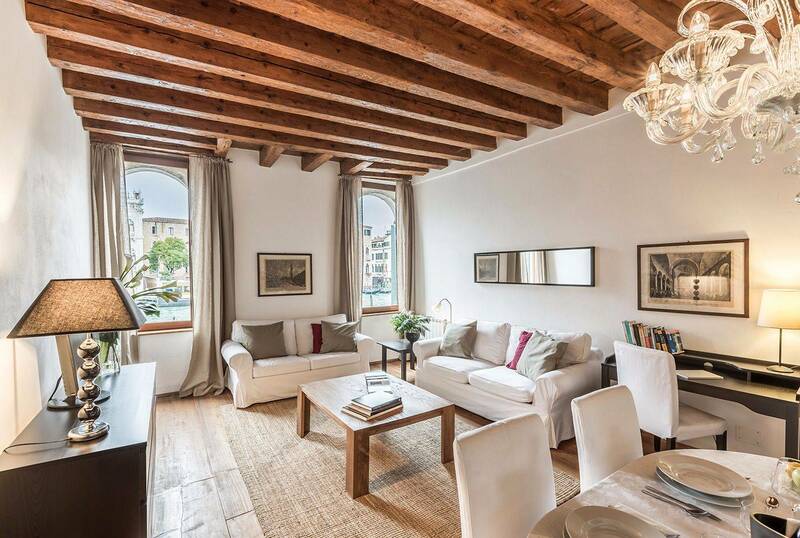 From the living room you can enjoy a spectacular view of the Grand Canal and the renown Cà D'Oro, one of the most important landmarks of the city. It has been recently renovated. 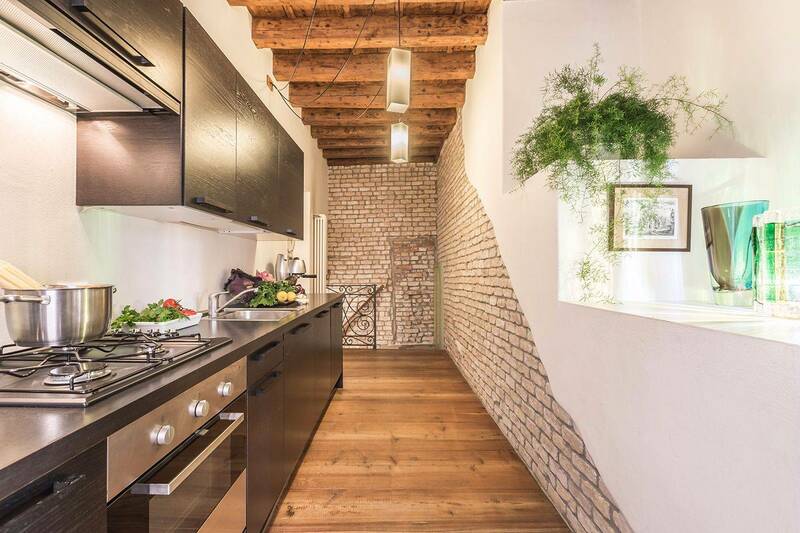 The owner chose to maintain the features of the typical Venetian homes such as the wooden beamed ceilings, the antique wooden board flooring, original raw brick walls, old stones. He then furnished it with minimalist style and arranged the most important amenities to ensure total comfort to the fortunate guests that will be staying at this special home. 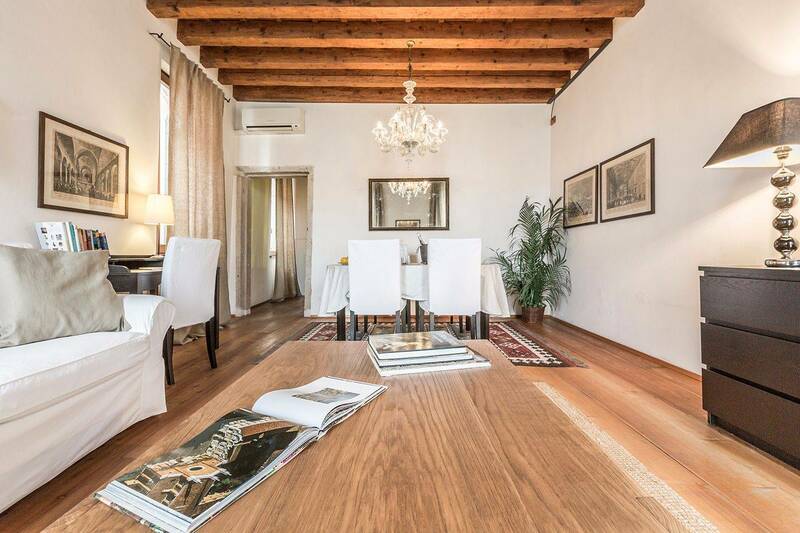 The Alba D'Oro apartment has a spacious living room with tall arched neoclassical windows, a comfortable double pull-out sofa bed and a table for 4-6 people. There is air conditioning in the living room and bedroom, wireless internet connection, flatscreen TV and DVD player. The kitchen is spacious and fully equipped with dishwasher, washing machine, oven, microwave, kettle, toaster, coffe maker and 4 burners gas stove. 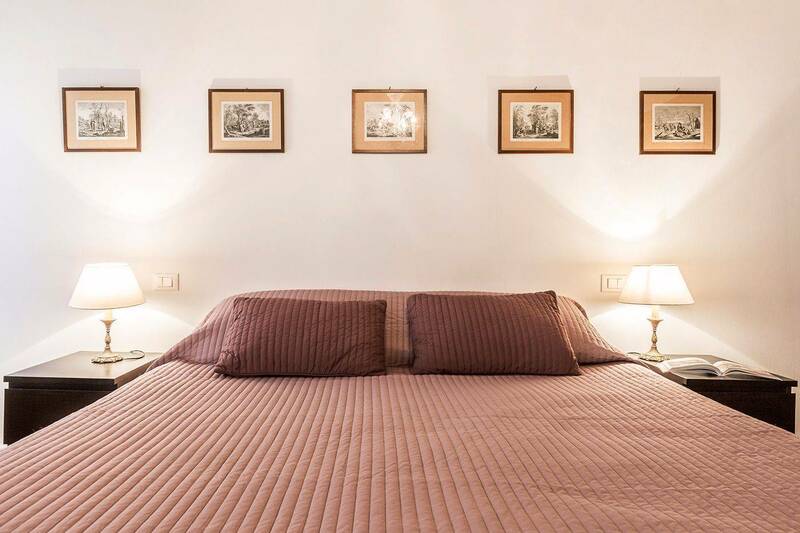 There is a generous bedroom with a double bed that can be separated in two single beds on requested. 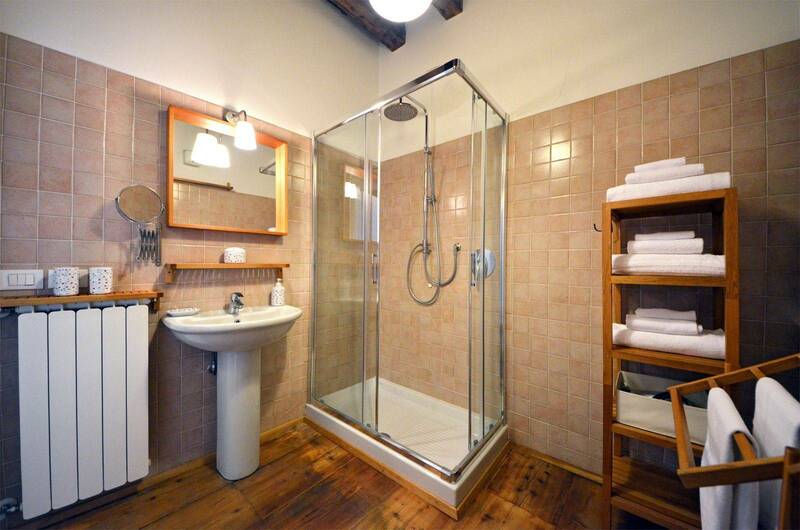 The bathroom has a spacious shower cabin. 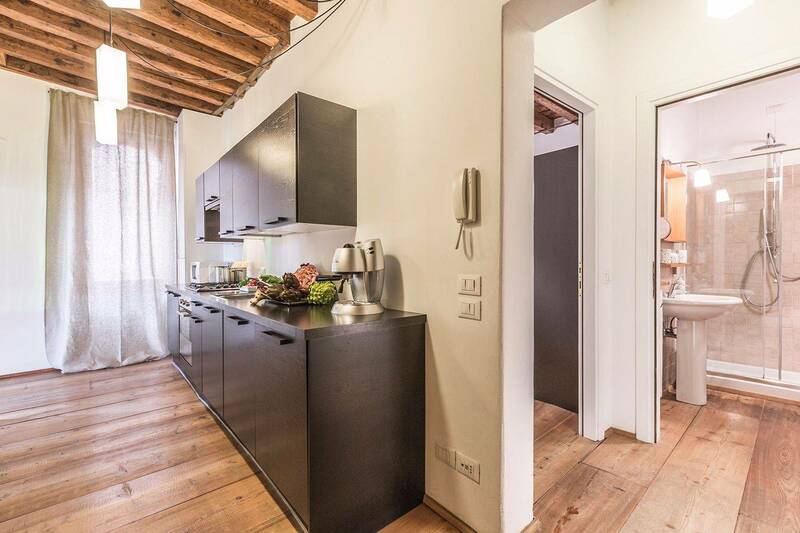 This apartment is easy to access, only 2 minutes walk to the Rialto Mercato Vaporetto stop and located at the first floor of a beautiful 17th century historic palace. The entrance door at the ground floor is only used by this apartment hence maximum privacy is guaranteed. 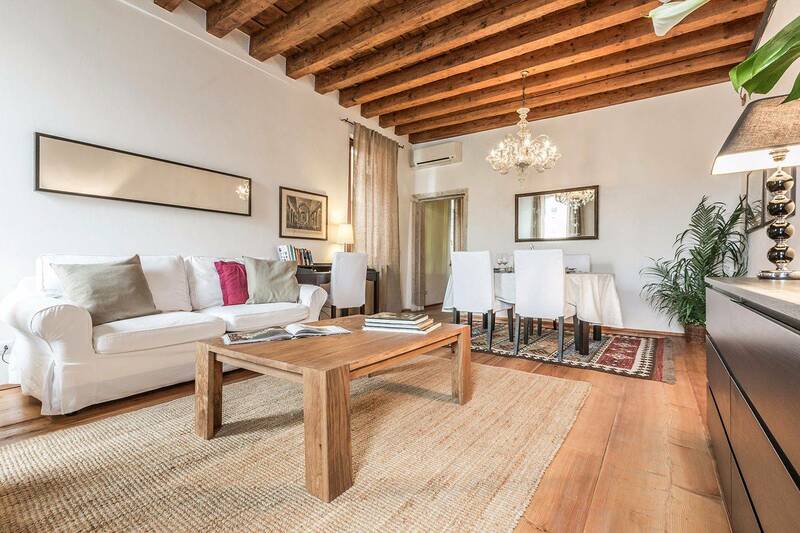 This apartment is perfect for those who like to experience the Grand Canal living and the Venetian cuisine being next to the market and in the heart of the San Polo district known for its numerous fine restaurants. Nous venons de passer 15 jours très agréables dans cet appartement magnifiquement placé face à la Ca D’Oro. La vue est superbe. L’appartement est très confortable pour deux. Le salon salle à manger est spacieux et lumineux , avec la vue sur le grand canal. La chambre est spacieuse, la salle de bain suffisamment grande. Le marché est à 50 m et il est très agréable d’y aller faire ses courses car tout est disponible. La cuisine est correctement équipée. En hiver le chauffage a été très efficace, ce qui est très appréciable à Venise. Bon accueil de la part de Truly Venice (et notamment Enrico). Nous reviendrons avec plaisir. 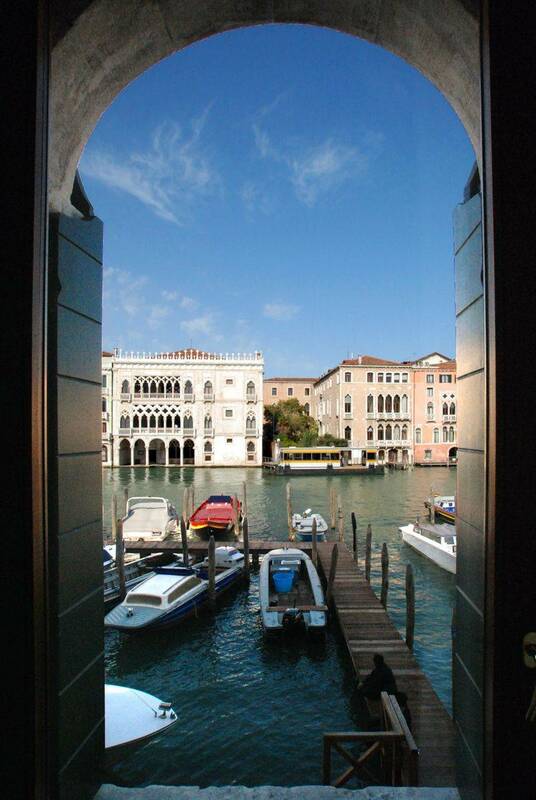 In perfect position with a stunning view of the grand canal and its daily activities. 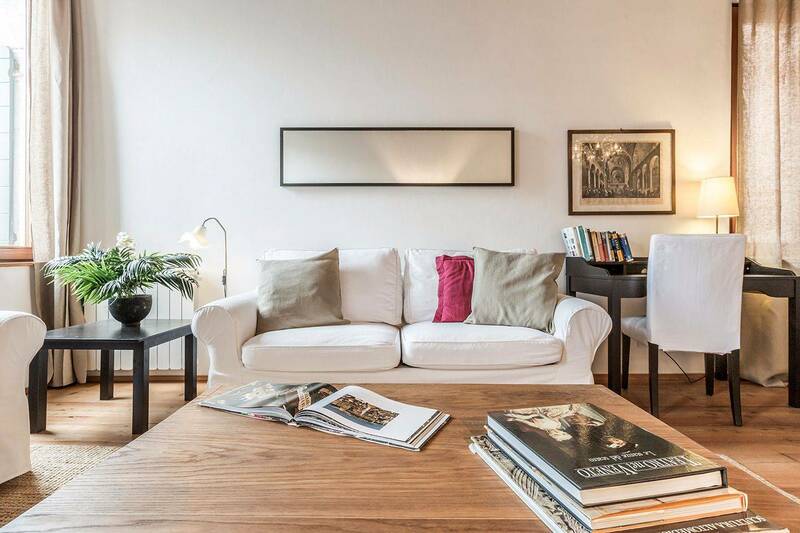 A comfortable apartment, beautifully clean and decorated with Italian style. Next to he market so making home cooked meals was a pleasure in the fully equipt kitchen. 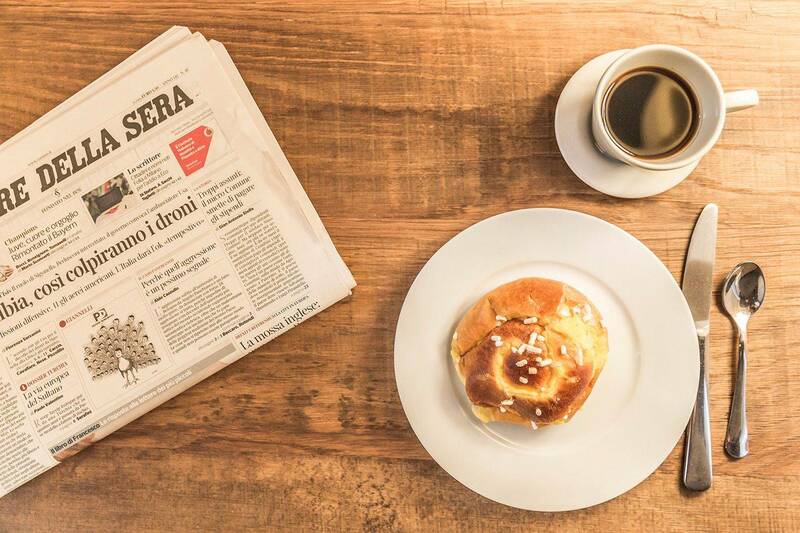 Alba d'Oro is in the most extraordinary position, on the edge of the Grand Canal with a view of the glorious façade of Ca d'Oro straight ahead, and the fish market to the right. Constant delight to watch the light change on the water and the buildings throughout the day. Extremely easy to access, the waterbus stop of Rialto Mercato is only a five minute walk. The flat itself is beautifully decorated, well-equipped, warm and comfortable. Any questions or problems we had during our stay were dealt with quickly and efficiently by Truly Venice's local team. Absolutely excellent and highly recommendable. Clean, spacious, nicely appointed and decorated. Private and quiet with an amazing view! Directly acrosss from Ca’ Doro and Ca’Sagredo. 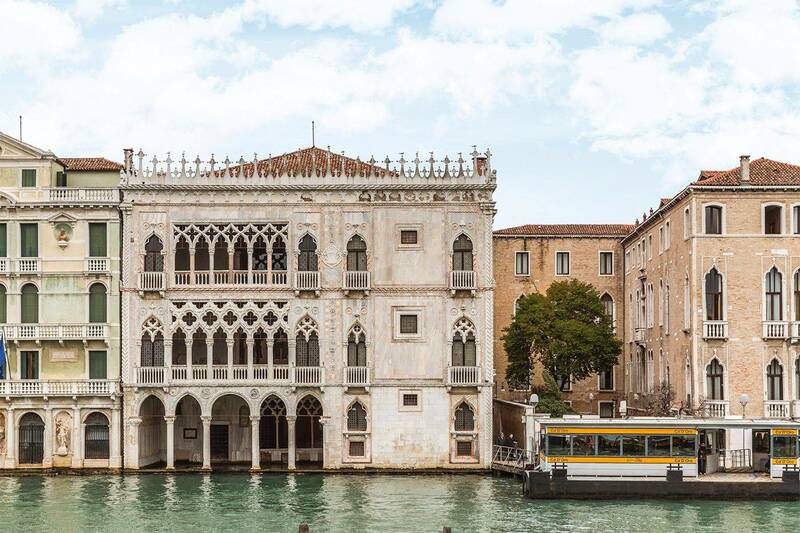 Two spectacular palazzos on the Grand Canal!! We loved our home in Venice! 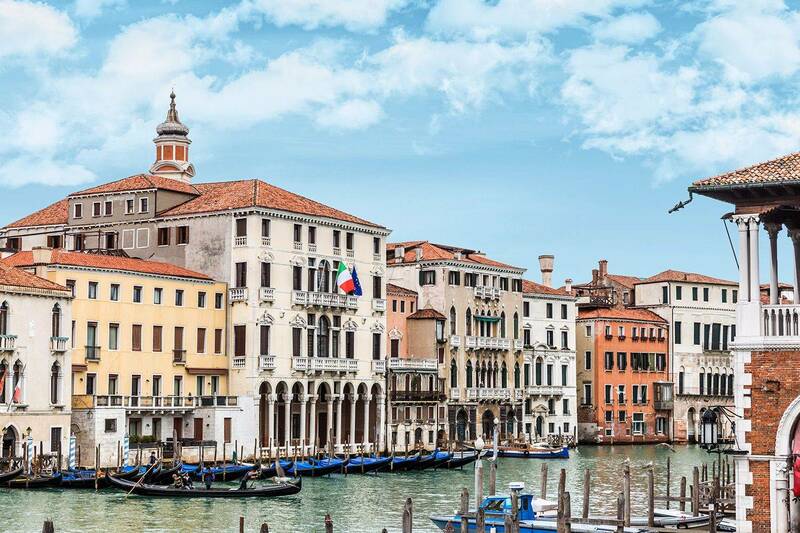 Perfect location and amazing view watching Venetian life on the Grand Canal. The apartment was clean, with everything we needed. Would definitely stay there again. 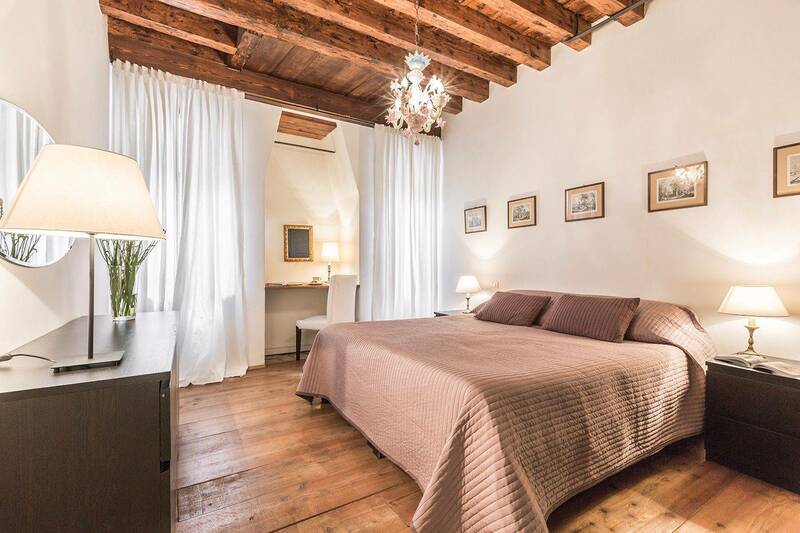 Alba d'Oro is a one-bedroom first floor (one up from the street) flat in a palazzo that also houses the new Hotel L'Orologio on a quiet street on the south side of the Grand Canal 350 feet west of the Rialto Markets. In other words, it is perfectly located for someone wishing to see Venice as a vacation spot for a week or more, rather than on a two-day tour where you rush from sight to sight. The Rialto Bridge is a 3-minute walk, the Doge's Palace and the Piazza are a 12-minute walk, and the neighborhood is relatively quiet and has all the shops and restaurants you need within a 5-minute walk. The flat itself has been updated, and is completely serviceable. Oh, and the view out the two large living room windows is worth the journey; my wife stand there with our morning coffee or our evening drink (or any other moment of the day) watching the world go by -- and in Venice, it all goes by boat. Deliveries of just everything take place on the dock just outside the windows. This was our 6th stay in this flat, and we wouldn't go anywhere else. The rooms are spacious; the kitchen has what you need and it works; even the shower is fully enclosed and has all the hot water you need. 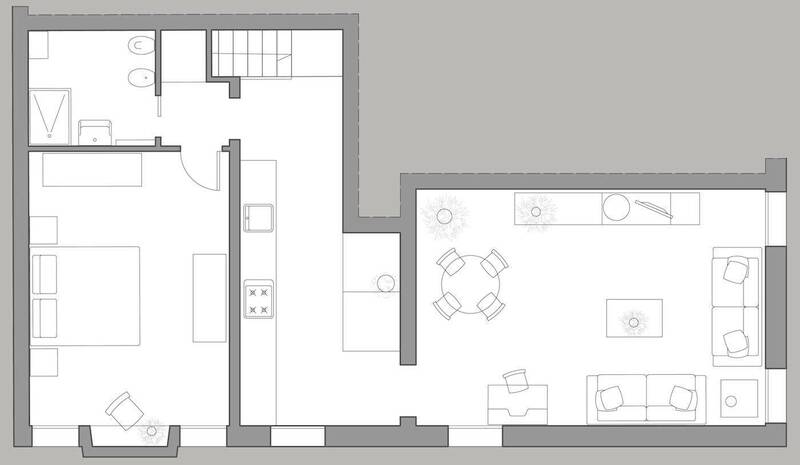 This flat really is an ideal romantic getaway. oh, and charming -- a mosaic in the entry floor discloses that one renovation was in.....1831. It really is cool. Alba d'Oro is our favourite holiday apartment in the world! We loved watching traffic on the Grand Canal at all times of the day and night, shopping at Rialto Mercato, cooking in the apartment and having drinks in nearby bars. Everything is so spotlessly clean and staying for 10 days meant that we had cleaning and a full linen change half-way through. This was our second stay in three years at Alba D'Oro and we wouldn't want to stay anywhere else on future visits to Venice. 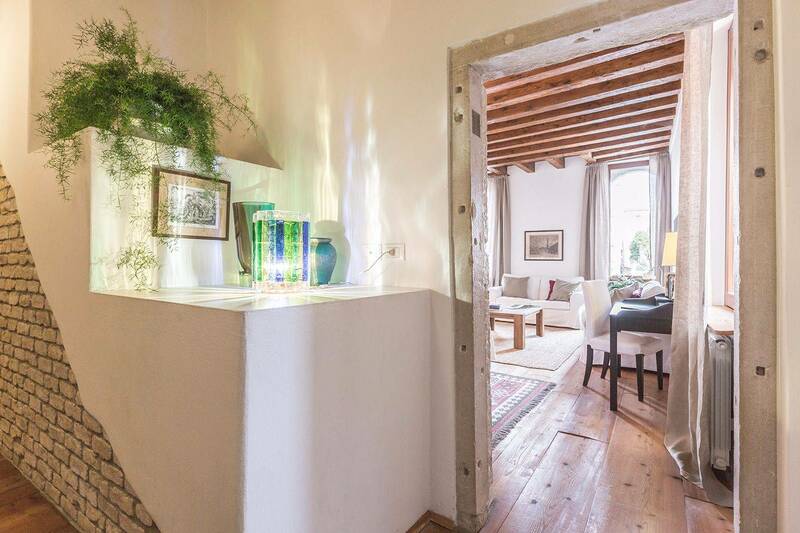 This apartment was spacious and beautiful with original wide plank floors, original beamed ceilings, and big windows that open onto the breathtaking views and sounds of the Grand Canal. 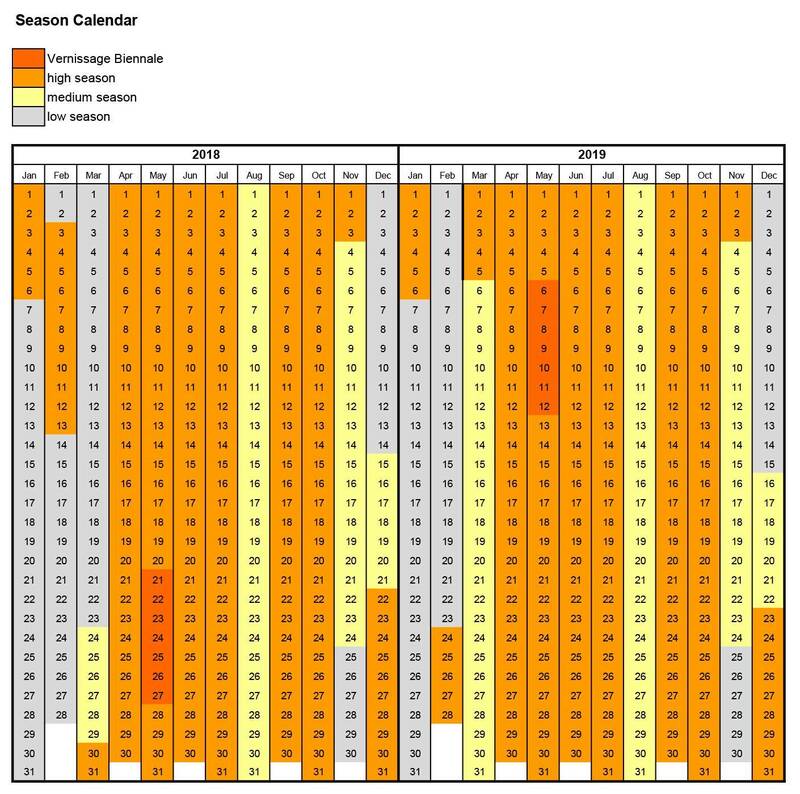 Everything I read said to stay away from staying in San Marco during the month of August. We are so glad we took that advice. The apartment is a four minute walk to the Rialto bridge but it feels a world away from the crowds of tourists on the streets. The bedroom was spacious with good closet and drawer space. The kitchen and bathroom as well were clean, new, spacious, and well equipped. The decor is elegant and the furniture comfortable. 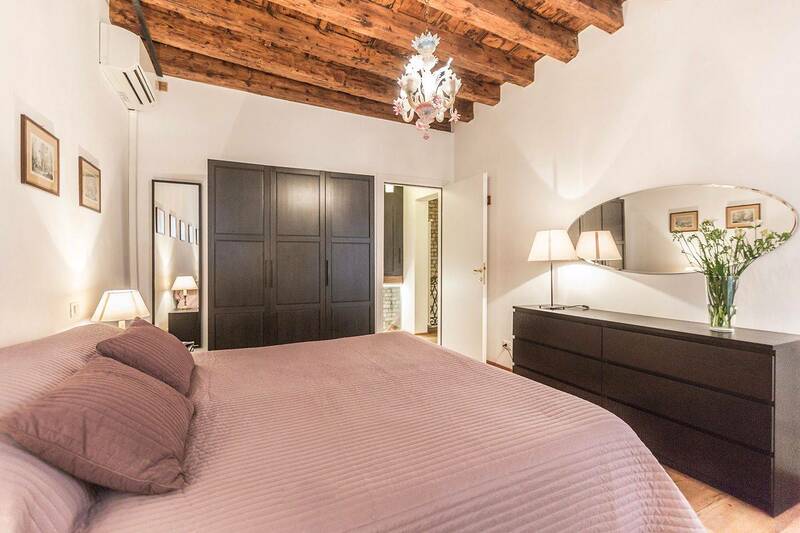 The Murano glass chandeliers hanging from the high beamed ceilings gave the rooms an authentic Veneziana touch. We highly recommend this apartment and hope it is as well kept and comfortable when we return. The apartment was terrific -- clean, updated, with everything one needs for two weeks (or a lifetime). 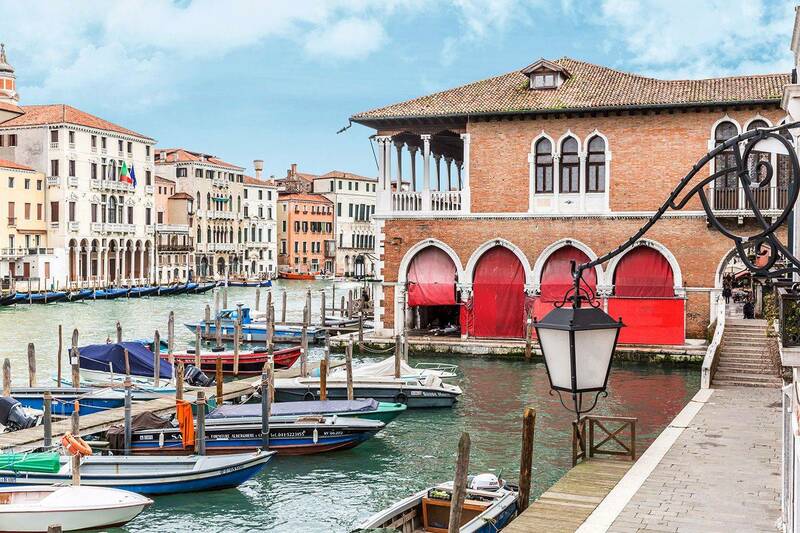 It has a Grand Canal view, and is 500' from the Rialto markets. So, getting everywhere is convenient, and shopping was a dream. The apartment was well-serviced (spotless), and well equipped; the greeter was punctual, knowledgeable and most helpful. This was our 15th vacation in Venice, and the facilities and service were the very best. I cannot say enough positive about the agency and the apartment. And, we are fussy. 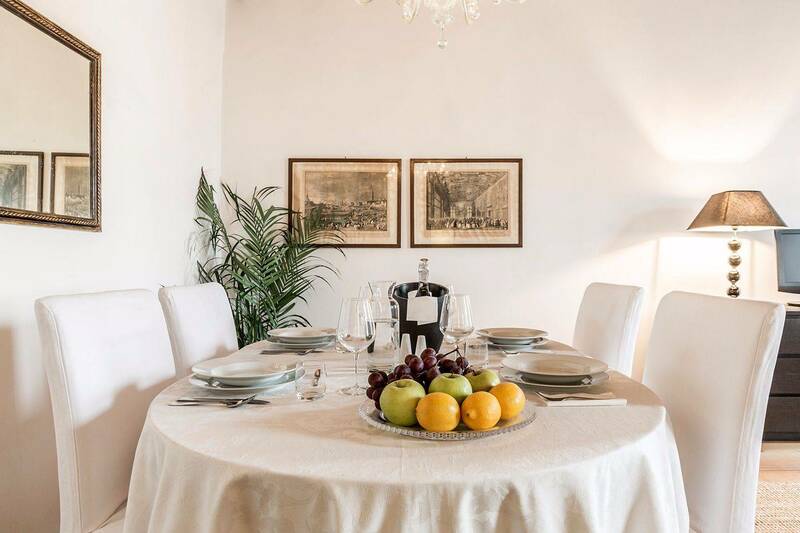 To begin, we greatly enjoyed our stay in the apartment Alba D’Oro! The apartment is very well-located, just close enough to the action without having the crowds and noise. The apartment, bedding, dishes, the bathroom were very clean. The kitchen is well equipped to cook; believe me I cook for a living. The contact person on site took the time to explain the functioning of the apartment and even provide us with a map to locate grocery, restaurant etc. If one day I have the chance to return to Venice, I would stay with Truly Venice! Merci! We are already making plans to come back for a month and stay here. Right by an amazing market. Quiet but close to everything. Beautiful view on the grand canal. My wife and I have stayed in Alba D'Oro for the last half-dozen years, and we are thrilled to have found this perfect one-bedroom flat with the living room windows overlooking the Grand Canal opposite the Ca D'Oro, only one block from the Rialto Markets, and less than 10 minutes from St. Mark's Square. 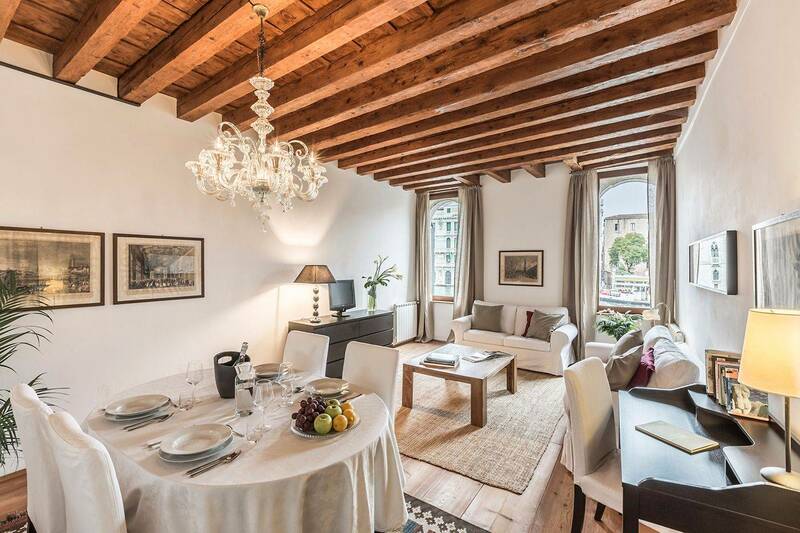 In an 1853 remodel of a Palazzo adjacent to the Hotel L'Orologio, you are up one original flight of stairs into a delightfully preserved (walls, ceiling, floor) but redone (windows, plumbing, electrical) building in a location you can't beat. The kitchen is properly equipped; the bath spacious and functional; the bedroom has 2 windows, a king bed, and adequate storage; and the living/dining room is spacious and comfortably furnished (good reading chairs and lighting). The price is quite reasonable for a view of the Grand Canal. Wonderful apartment! 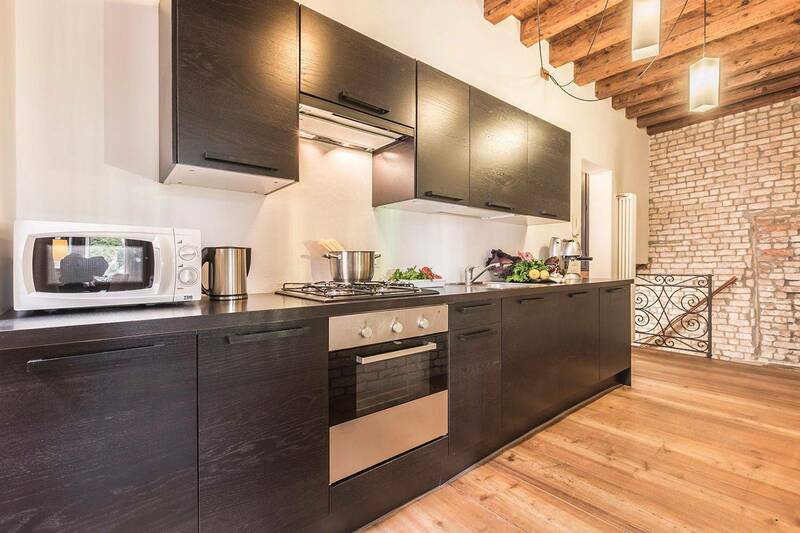 We spent a week at alba D'Oro in Venice, and we enjoyed the whole experience. The location, very close to the Rialto Mercato vaporetto stop, is perfect for walking everywhere. The apartment is beautiful and overlooks the Grand Canal. The rooms are large and beautifully furnished. The bed is comfortable and there is plenty of storage space. The kitchen is great, and we made a number of meals using the Rialto market to supply us. Truly Venice was very easy to work with. Both deposit and final payment could be made by credit card. They also have a complete book of instructions located in apartment. Every rental agency should do this. It can be very difficult to remember how to operate the washing machine after getting verbal instructions days earlier! The book also includes sightseeing suggestions as well as recommended restaurants. This is our "return to" apartment in Venice! Brilliant and beautiful This is the second time we have used Truly Venice for accomodation in Venice and again the didnot disappoint. The company is extremely professional and courteous from the booking arrangements to being met at our apartment, nothing is a bother. The apartments are well maintained and contain everything that is needed, especially in the kitchen, from cutlery to condiments to coffee makers. Our stay this time at apartment alba D'Oro was faultless. The accomodation was excellent and the view and location, priceless. I will use this company again and have recommended it to many people. Thankyou Daniela for another wonderful Venetian experience. Magical views set the scene for a wonderful 9 days The experience from the water taxi pickup at the airport to the greeting at the canal side to the apartment - were all first rate. The apartment is spacious, the views from the lounge extraordinary and location first rate. The Rialto markets are 5 minutes away, and have great seafood and fruit and vegetables. Nothing to criticise. We could not fault this Grand Canal apartment. It was very clean and spacioous and ideally located. The fish and produce markets were right next door and the views were spectacular. We were there in the middle of winter and were grateful that the heating was so efficient given it was at times below zero degrees at night. Thank you to the staff at Truly Venice who was most welcoming and helpful showing us through the apartment. Can highly recommend the water taxi pick up and drop off service. We even hired it or a two hour trip to Murano and Burano in his water taxi. When we are next in Venice we will definitely rent through Truly Venice. Thank you for helping make our 5 nights in Venice so memorable and comfortable!!! Just wanted to thank you for another wonderful Venetian experience. This is now the third time we have rented Alba d'Oro from you and we truly love the place. We hope that it remains available for many years to come. My sister visited us for a day while we were there and was instantly in love with the apartment. She plans to rent it in the future with my other sister. I am not sure when that will be but knowing her, it will happen.